I originally became aware of Fleetwood Mac via their chart topping single ‘Albatros’ (1969), an almost ambient instrumental opus that had your senses surfing on an ethereal wave of sound – band founder Peter Green’s hauntingly understated guitar a joy to behold. Starting out as a British Blues band formed in 1967, and hailing from London, Fleetwood Mac took its name from 2 of its members, drummer Mick Fleetwood and bassist John McVie. They went through a whole series of personnel changes before arriving at the ‘Rumours’ line-up of Fleetwood, McVie, his ex-wife, the singer and keyboard player Christine McVie, plus, re-inventing the band as an Anglo-American collective, Lindsay Buckingham (guitar / vocals) and singer Stevie Nicks. Their sound now embraced the Album-Oriented Rock (AOR) category that was so popular on FM radio in ’70s America, and ‘Rumours’ would be the perfect fit following its 1977 release, spawning 4 US Top 10 singles, ‘Go Your Own Way’, ‘Don’t Stop’, ‘Dreams’ and ‘You Make Loving Fun’. It was radio gold. However, this wasn’t music played in the clubs (at least not in those I worked in or went to back then). It wouldn’t be until later that the band’s Balearic credentials brought their music to the dancefloor, their 1987 single ‘Everywhere’ gaining anthemic status. In more recent times I’ve featured the wonderful Psychemagik edit of ‘Everywhere’, along with Rocco Raimundo’s take on ‘Dreams’, which I re-touched for the ‘We Love Dreams’ DJ Only 12″. This goes to illustrate how Fleetwood Mac have a resonance that persists all these years on, their laid back style continuing to work its magic with a new generation of music enthusiasts. Takes me right back to ’77 and my first year at high school. This was the massive record of the year, but I was a bit of a snob about it. Too busy soaking up the first emanations of punk… and 10CC! Rumours was everywhere, maybe one of the reasons I reacted against it. Brilliant listening to it now. Pure AOR, with all that that entails. Beautiful harmonies, guitars, some pretty trite lyrics, slick production. The highlight for me is Mick’s rolling drums on Go Your Own Way. I could listen to that drum track on repeat all night. The songs are classics… apart from ‘I Don’t Want to Know’. That’s a turkey and the only bum note on an ageless album. A true desert island disk if ever there was one. Listened to this twice in row on Sunday night, via spottify, while cooking and eating a nut roast at my mates house! Great album! Will be snapping it up on vinyl whenever it finds me. This was the first time that I haven’t been able to listen at the allocated hour. I was in Sydney, and the following day I was heading back to the UK. I’d have had to have got up early in the morning to do so, when I needed a good sleep ahead of the 34 and a half hour marathon I had ahead of me (from the door of my Sydney hotel to the door of my home). Plan B was to listen over headphones on my computer at some point on the flight between Sydney and Hong Kong, the first leg on my journey. Whilst I was in Sydney airport I bought my son a present, a pair of Beats By Dr Dre headphones, and when, on the plane, I saw that ‘Rumours’ was amongst the selections in the classic albums section on their in-flight entertainment, I took the opportunity of roadtesting them, and checking the album out in this way. Thoroughly enjoyed listening to ‘Rumours’. It’s surprising just how optimistic it manages to be, despite the fact that the relationships of all the band members (including 2 sets of couples) were in complete turmoil. ‘You Make Loving Fun’ and ‘Don’t Stop’ have particularly stayed in my head since. Enjoyed listening to the album even though I have never been a Fleetwood Mac fan ever since Peter Green went his own way. It’s really well put together and well produced pop music. The country music inspired tracks came as a bit of a suprise having never really listened to the album in it’;s entirety. I enjoyed those particular tracks. I found the documentary about the album fascinating some years ago. As the band were just about hanging together someone mentioned in the LTM listening session that the tracks don’t really hang together in the order they were presented and it made me think maybe they wouldn’t work in whatever order they were presented as the diversity is quite marked. Perhaps this is a reflection of the diversity in the band at that particular moment. No matter what I think it still remains a classic album that will be around for many years to come! An album in which art imitates life. As others have mentioned, as an album Rumours seems to be lacking in coherence – with some real gems nestling amidst some real oddities. Perhaps this was the result of power dynamics and relationship breakdowns within the group – the excesses of the time – or due to the emergence of new roles and identities within the band that had still to take root. Whatever the case, this album has a real sense of chaos about it – carefully contained chaos but chaos nonetheless – with the band dancing on the edge of the abyss and unable to do anything but keep on dancing til the moment has passed and the change has come. Which also makes it an album of integrity if not of coherence – a genuine reflection of a reality filled with chaotic feelings, drug fuelled recording sessions, and uncertaintly about the future. Yet, as Greg says, also containing genuine seeds of optimism and even humour. (“Oh Daddy,” Christine’s breathtakingly heartfelt piss-take about Mick always being in the right, being a good example of the latter.) All of which combine to make a very fertile, if somewhat disquieting, listening and pondering experience. Rumours is as far as it gets from the slick, sleek production we expect in this digital age – yet I can see why Greg chose this album and not any other by Fleetwood Mac – as it captures a fascinating moment of transition for the band and expresses both the shadow and light of the time; namely that hearts can be broken no matter how openminded, rich or beautiful you are…And that fame is a demanding master. Not an easy listening experience, but certainly a rewarding one. Less than stellar AOR with a really muddy midrange. Made me want to listen to Fairport Convention instead. Cocaine use obvious throughout the album, especially in Lindsay’s contribution. Good drumming and drum sounds though. A very good friend of mine used to come over and we would get slightly relaxed and listen to Fleetwood Mac albums very late into the night, listening to this album brought back those fond memories. 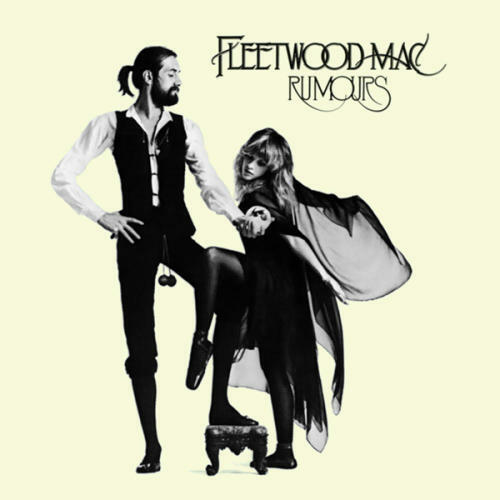 However, Rumours was never one of my favourite albums despite it being so popular, I admit Stevie Nicks and Peter Green are the real heros for me and listening to Lindsay Buckingham’s cathartic babblings just makes me cringe. I just find some of the tracks too middle of the road/easy listening despite the dynamics of the band at the time. I was a lot more familiar with Fleetwood Mac’s 80s incarnation (Tango In The Night) when I was younger, and had only really heard the singles from this album when a friend’s older sister picked up the cassette on holiday in about 1991. (To be honest, at the time I was far more into Beats International’s forgotten second album). It fits much of the same criteria as the Paul Simon record, in that it lacks the funk I usually gravitate towards – it’s the kind of thing I like to be surprised by once in a while, or enjoy with my Dad. The songs are great, pure quality. Second Hand News Is a good opener, but kind of leaves me a bit cold compared to the rest of the album. One thing that occurs to me now as an adult still harbouring delusions of being a successful maker of music; this is a fantastic study in that trademark super-dry 70s rock sound, and for that alone this listening experience is invaluable. To go off on one for a minute – Dreams is, for me anyway, in that incredible group of more recent Fleetwood Mac singles with Everywhere, Little Lies, and Big Love – which seems to transcend the rest of the band’s canon (yes, I know that’s pretentious). I’ve always loved these tunes (as have many others of my generation), which have been given a fantastic new lease of life recently, and the combination of ethereal atmosphere and danceability is something these tunes share with much house music, and it made perfect sense to discover retrospectively that these classic singles were part of the soundtrack for the early Balearic scene. Never Going Back Again – again, the acoustic rootsiness is just not really on my taste radar, but hearing it now is very evocative of the time I first heard it. Hang on iTunes just freaked out and scared the bejesus out of me with some main room banger or other. Don’t Stop seems kind of hopelessly optimistic on the one hand, with elements of wishing your life away on the other. It’s a belter though, eh? It has to be good for me to tolerate a 6/8 time signature 😉 (the other tune in this category would be Bad Company’s Can’t Get Enough Of Your Love). I wish my hands fell onto a piano in that effortless bluesy triplet fashion. Go Your Own Way is great. I don’t really listen to lyrics, I should confess at this point…which is probably bad, but I tend to obsess over the nuts and bolts of the music itself, the arrangement and the sonics, that kind of thing. Point being, I’m sure there’s an empowering message in the lyrics, but I take a far greater one from the effect the chord progression has. I probably listened to Songbird when I was young and felt sorry for myself (it didn’t take much). The Chain- to be honest I completely forgot this was on this album, again, it seems to stand alone amongst the Mac’s catalogue. This stands out for two reasons actually, one is that my 6 year old son has just discovered this on some programme/film or other and regularly snatches my phone off me for a quick blast. The other is hearing it on a James Lavelle (as Unkle?) Fabric mix CD where he/they had re-edited the famous fast second half into a mental glitchy monster. Oh Daddy isn’t something I can really listen to too comfortably – it’s obviously an intensely personal song. I don’t recognise Gold Dust Woman, maybe we never got as far as that driving round Cardigan Bay, but it’s got heavy slide guitar and cowbell is always OK. It’s got a great groove, has anyone edited this?…..
Well, I didn’t manage to listen to this on Sunday BUT did listen to it with my daughter, who was fascinated by the names and relationships within the band. I, however, LOVE this album. Okay, as most of you have pointed out, it’s not perfect, the songs order isn’t cohesive, but could it ever be? For me, i was pulled right back to being 14, sitting in the loft of the VG stores in newton, with all the “hippies” I knew and loving the folky/country harmonies, guitars and from this listening, the drums!!! I am totally with Patrick on the drums, they rescued some tracks. I do have to say that Henry’s comment about the cowbell, made me see the Will Ferrell skit of the Blue Oyster Cult and I can’t stop laughing. Perhaps i was getting too serious anyway….great, aor album, with Stevie Nicks vocals a mile above everyone elses!